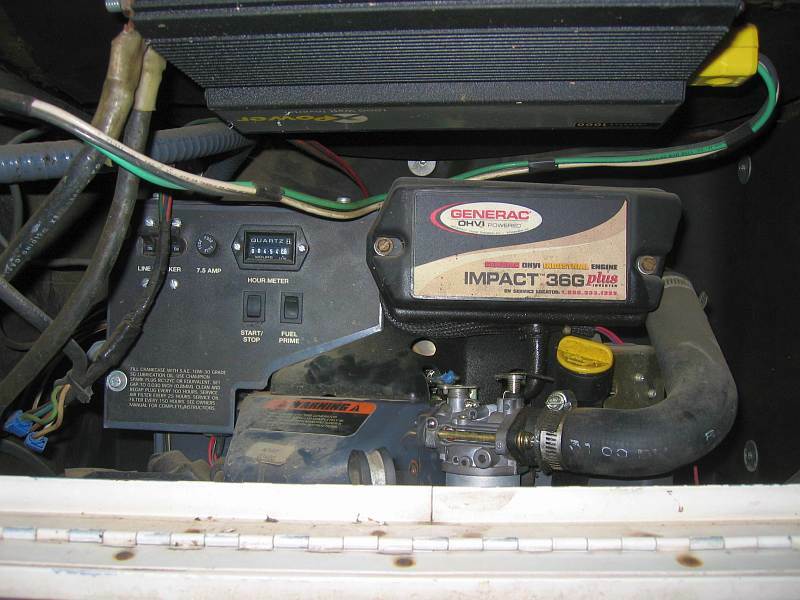 My Impact 36G installed in my motorhome's generator compartment. My 1500 watt inverter is visible attached to the top of the box. I'm annoyed. Multidimensionality annoyed. I've been hosed multiple times by the EPA and the environazis and the chemophobes. 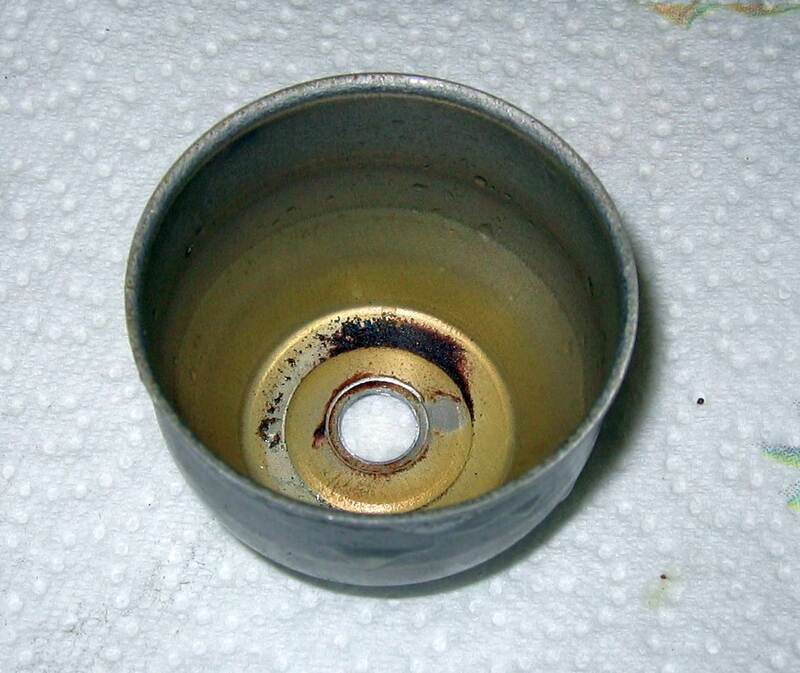 You have been too if you use a utility engine on your generator or lawn mower, etc. Let me show you how. I've always taken great care to lay up my portable engines when I put them in storage. 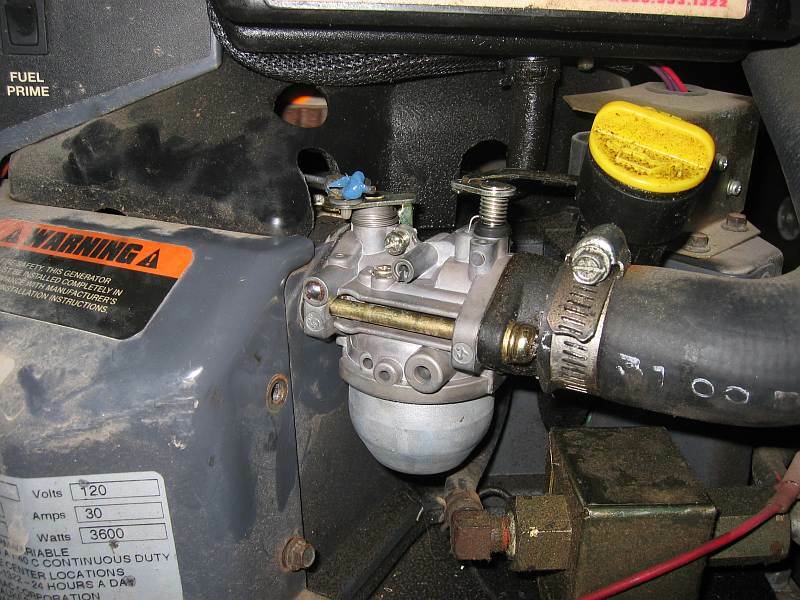 Among other things, that involves letting the engine run with the gas cut off until all the gas is used up. Then, if the carburetor has one, I open the drain valve to remove the remaining fuel so it can't sit there and crud up. Unfortunately this one doesn't. I did all that a year ago when I put my motorhome in temporary storage. This year I get it out, fire up the generator - or try to - and find that it won't run without manual choking, won't take throttle and won't sustain a load. 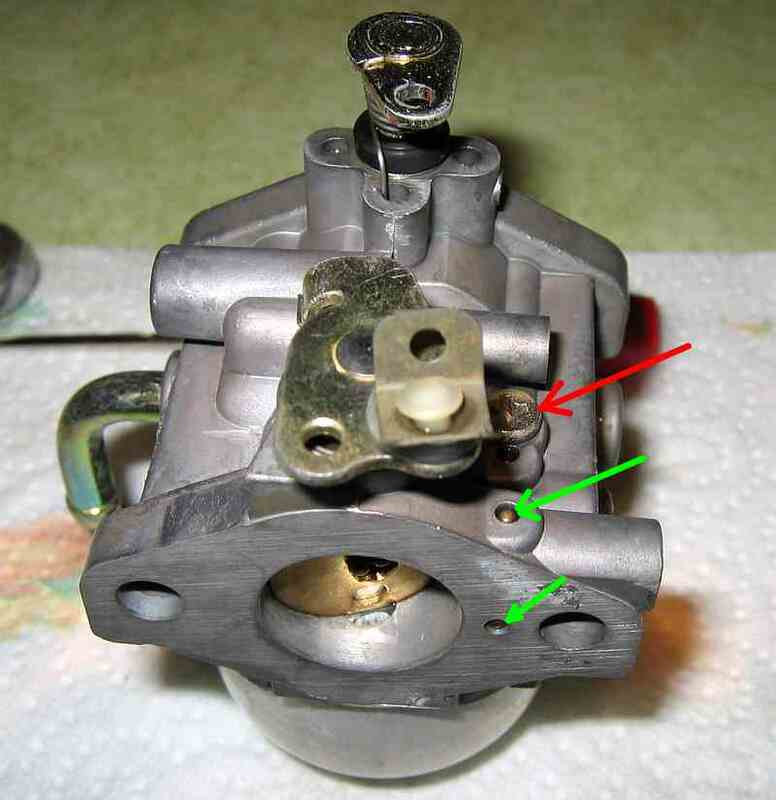 Everything points to a crudded-up carburetor. So today I took it off to see what was wrong. When I got the thing off the generator I was pissed. Absolutely no adjustments. Thank you EPA. 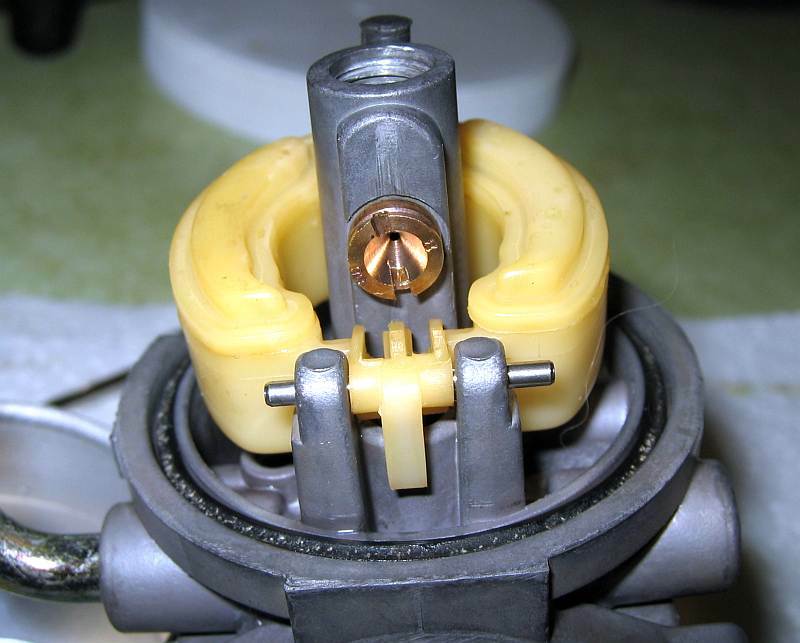 That means that when the carb jets get the least bit fouled, you're stuck with a poorly running engine until you can do something about it. At the repair shop, that "something" will be a new $300 carburetor! When I got the float bowl off I was doubly pissed. The main jet was half way up the friggin' float bowl. Sure enough, here's the crud. And the most important idle jet. Look at all that crud! That's why it wouldn't idle or pick up load! 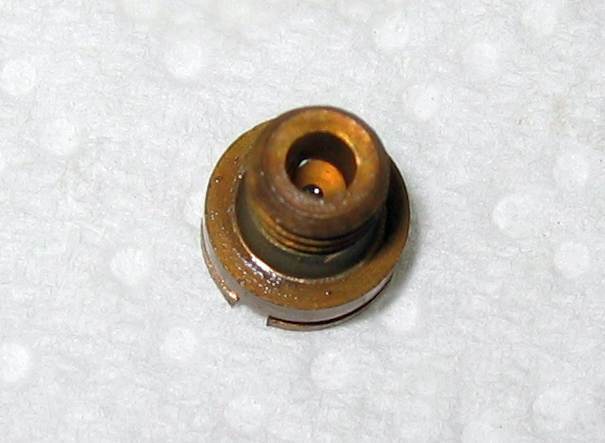 The bottom plug that holds the float bowl on AND seals the main jet chamber. Look at all that crud! So I trundle down to the local NAPA store to get a can of carburetor dip. I wanted Berryman's but all they had was NAPA brand. I figured Berryman made the stuff for NAPA so I took it to the counter. $47.00!!!! for a gallon can! Damn! Worse, as I look on the label I see the most important ingredient - cresylic acid - is missing. 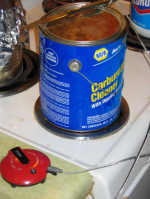 Cresylic acid is the magic stuff that eats off all sorts of organic materials including varnish, sludge and carbon. Oh My! Cooking highly flammable chemicals on the kitchen stove! The little red puck is my fancy-dancy wireless BBQ thermometer. I just stick the probe in, set the finish temperature on the wireless receiver and come back here to play on the computer while the stuff cooks. In this case, at 100 deg F.
When the temperature gets to the setpoint, a sweet l'il female voice says "your meal is done". Cute. Here's the result after half an hour's soak in the cleaner followed by a toothbrush scrubbing with Purple Stuff. Not as bad as I thought. Actually fairly good. Most importantly, the jets are now clean. 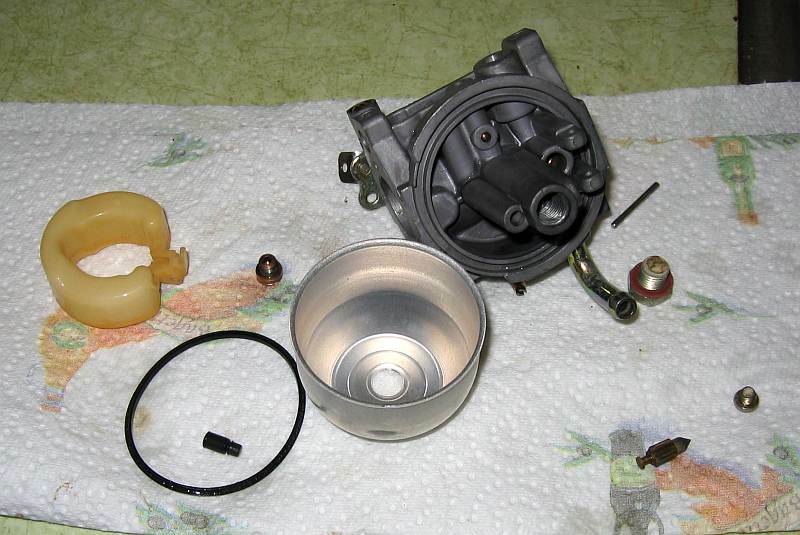 Here's the carb reassembled. The red arrow points to the ONLY access to any of the metering circuits. 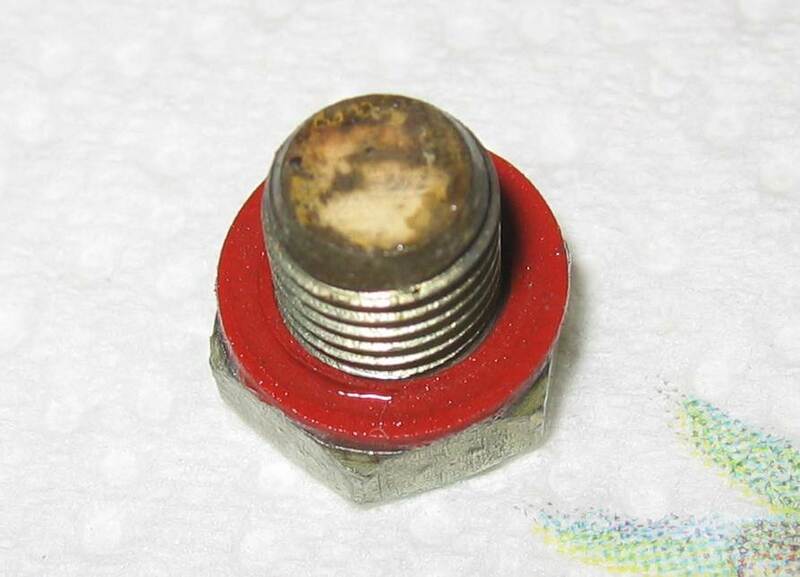 Under this screw is the idle mixture jet. The green arrows point to places where balls were pressed in to seal passages. No practical way to remove those balls to clean underneath. Thank you yet again EPA! Here he is reinstalled on the generator. The glob of blue RTV on the throttle shaft keeps the stepper motor servo arm locked in place. 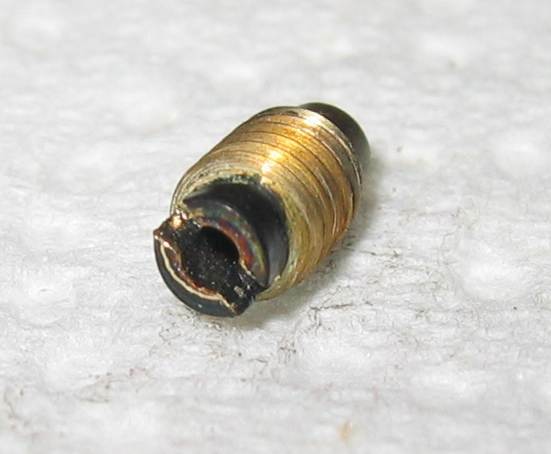 The cheesy Generac-supplied clip just doesn't get the job done. It fires right off and idles down as nicely as when it was new. It picks up load equally smoothly. Here's one of the handiest things I've installed on my RV. 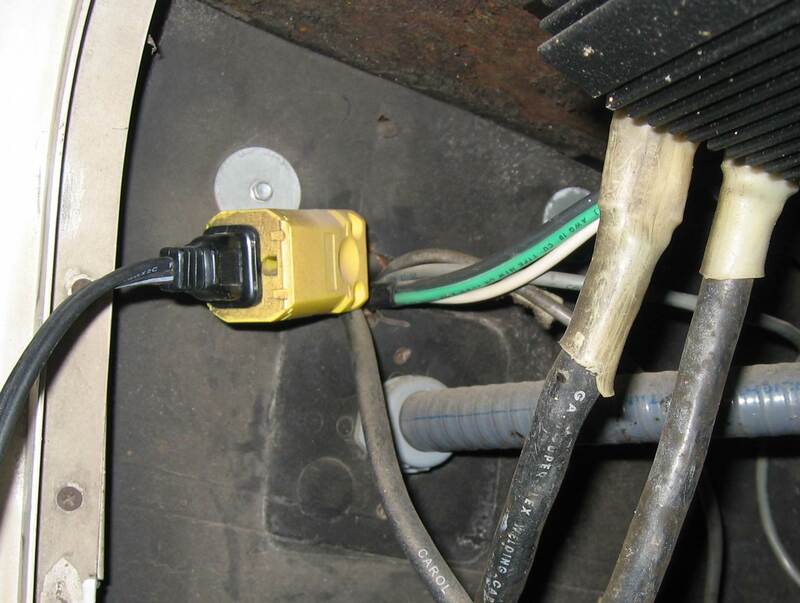 This outlet connects directly to the generator output ahead of any breaker panel or transfer switch. It lets me access the full output of the generator without having to pull a cord inside or muck around with light duty breakers and outlets. I use this a LOT. I plug my Fry Daddy deep fryer in here when I'm camping. I plug power tools and lighting in when I'm working remote from utility power. Super handy. The heavy wires are the 12 volt feed to the inverter. I designed and built a 3-way transfer switch that switches power to the RV from inverter, generator and shore power in that order. 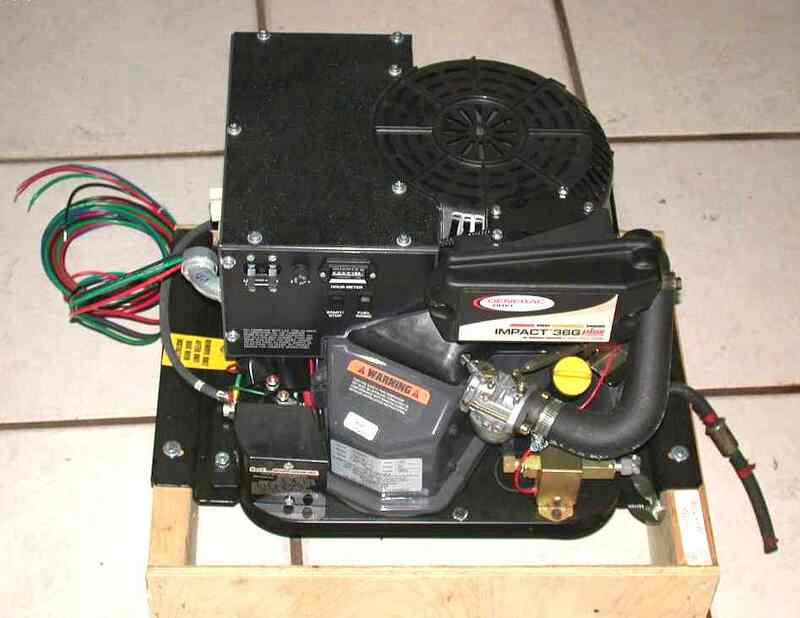 The inverter has the highest priority, followed by the generator and lastly, shore power. This scheme lets me transfer to generator power in case the shore power gets flaky by merely cranking the generator. And if I want to use the generator's full output on something plugged into that outlet, I simply flip on the inverter and the house loads are picked up by it.